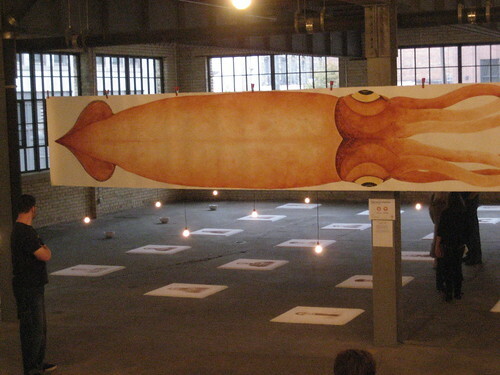 Printmakers Todd Freeman and Meg Perec of Freeman & Perec recently created “Sixty Foot Ghost”, a site specific art installation that recreates a 60′ giant squid. The project was created for ArtPrize 2009 and is currently on display at 47 Commerce SW in Grand Rapids, MI. Large animals captivate like few other beings can. They are deified, hunted, consumed and catalogued. While our culture has seemingly amassed a working knowledge of all living species on the planet, one of the world’s giants has successfully eluded the scientific community for centuries. Save for a few partially decomposed specimens virtually nothing is known of Architeuthis dux, the Giant Squid. Architeuthis is a 60 foot ghost, moving unnoticed through deep and dark. 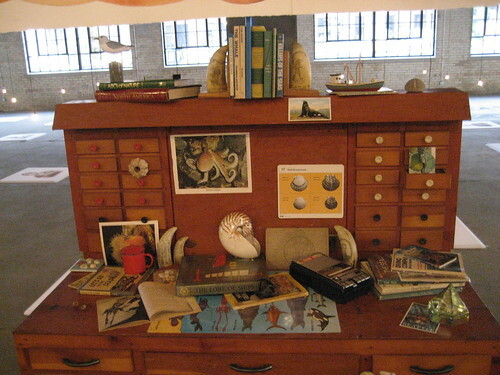 Our representation of the giant squid was conceived out of a need to see the animal for ourselves, beyond pale museum subjects or small renderings in books. At life size, the true scale of Architeuthis becomes clear, a massive, unfamiliar animal deserving of the same fascination and wonder owed to any whale, elephant or dinosaur. Our intent is to bring the myth into a gratifying real space, and give the viewer a chance to be confronted with one of the largest and most secretive animals to ever live.